The Peak Expiratory Flow (PEF) is a measurement of how much air flows through the airways in the lungs. If the airways are narrowed, as in episodes of asthma, then the readings are lower. By recording and charting these readings we can better understand your asthma. 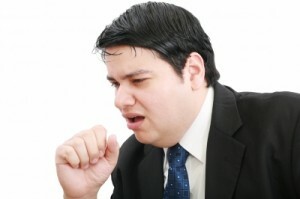 There are four main patterns of peak flow charts that are suggestive of asthma. But first we will examine the chart of a healthy person. The above chart shows readings with small variation in readings. This chart has a percentage change in PEF of less than 20%. This type of chart is seen in people who have well controlled asthma or those who do not have asthma. The above chart shows a large variation in peak flow reading from day to day. A chart like this would help to confirm the diagnosis of asthma. For someone with asthma a chart like this would indicate poor control and more treatment is required. A peak flow chart showing early morning dips in the readings would help to confirm the diagnosis of asthma. For someone with asthma, this chart indicates poor control and more treatment is required. This chart shows readings that are dropping from day to day. This person has poorly controlled, deteriorating asthma. Urgent help is required. This peak flow chart shows a gradual improvement in readings. This is normally seen after someone has started asthma treatment. The peak flow charts on this website have three bands, called the Green Zone, Yellow Zone and Red Zone. Your peak flow readings will fluctuate every day. A health person without asthma peak flow readings would fluctuate by a small amount. There are many factors which can affect your peak flow reading. The aim of the coloured zones is to identify if the fluctuations are within an acceptable level. You should aim to maintain your peak flow readings within the green zone. The green zone shows that your peak flow reading is within 80% to 100% of your personal best peak flow reading. If your readings are within the green zone then you should be relatively symptom free and should continue your current asthma treatment plan. The yellow zone shows that your asthma is getting worse and you need to temporary increase your asthma medication. If your peak flow readings do not return back to the green zone, then you may need to change your asthma treatment plan. Please consult your doctor or asthma nurse. The red zone is the danger zone. If your peak flow readings are within the red zone then you need to take immediate action. Please consult your doctor or asthma nurse. It is important to reduce the number of Asthma triggers in the entrance to your house, as many triggers from the outside may be brought inside. 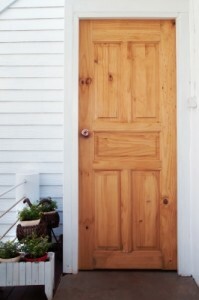 Here are a few ideas of how to remove triggers from entrance and hallways. Use a doormat as this can collect allergens and stop them entering the house. The doormat should made from synthetic materials as doormats made from natural materials may break down. Remove any dead insects from around your light fittings. As the bodies decompose they can become a source of allergens. Place a shoe rack in the entrance and encourage people to remove there shoes. This will reduce the amount of dust and allergens that are brought into the home on the bottom of peoples shoes. Consider removing carpets and replacing with hard floor for easy cleaning. The bathroom is often warm and wet. Which makes the bathroom the perfect place for mould and mildew to grow. Below are some ideas of how to remove Asthma triggers from the bathroom. Regularly was the shower curtain. Regularly wash the bath mat, as a damp mat can attract dust mites and mould growth. Switch on extractor fan or open window after having a bath or shower, to remove damp from the bathroom. Check under the basin for leaks. Check that the toilet overflow has been fitted correctly and works. To prevent water from leaking into the walls. 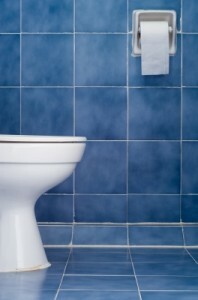 Regularly check the grout around the titles to prevent leaks that could lead to mould growth. It is very important to remove Asthma triggers from the bedroom, because of the amount of time that you spend in bed and many people find that there Asthma worsens during the early hours of the morning (sometimes called the Morning Dip). Ensure that pillows have synthetic fillings. Consider covering the pillows and mattresses with dust bite barriers. Wherever possible replace carpets with hard flooring and rugs that can be easily washed. Replace curtains with blinds that can be easily wiped clean. Remove anything that contains natural feathers, dust mites love feathers. Consider removing soft toys like teddy bears, or wash them regularly. Change to a metal or wooden bedstead. 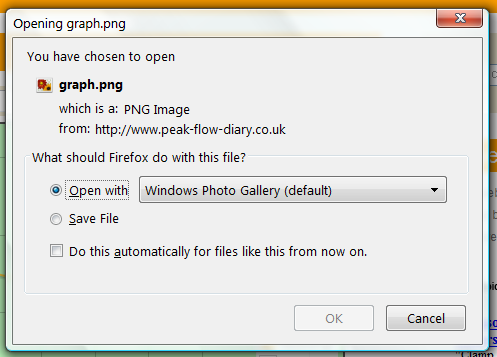 You can save your peak flow chart as a image file (png) simply by clicking the save icon. The icon looks like a computer disk and is situated below the graph. 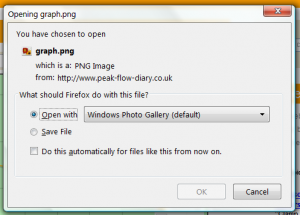 After clicking save a dialog box will open asking you if you wish to save the image or open. Open will open the image on your local computer. Save will save the image to your downloads folder. Changes in you medication can have a dramatic effect on your peak flow readings. 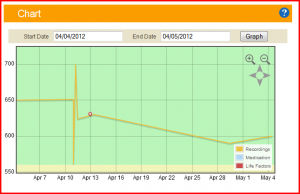 The Peak Flow Diary website allows you to record any changes in medication. 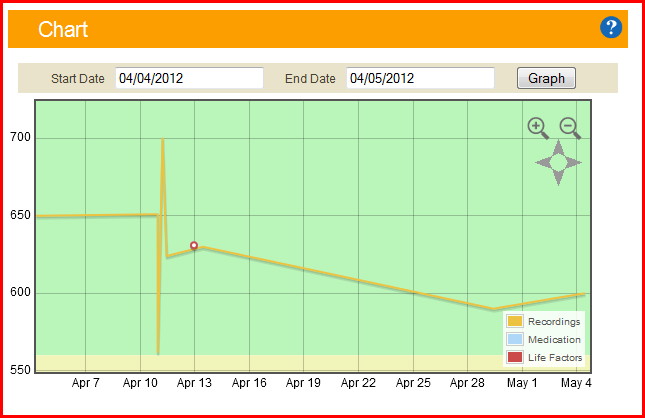 To do this go to the Chart page and then click the Medication Record icon, which is situated below the graph. Enter the date of the medication change, then the medication name, dose and finally the frequency the medication is taken. Then click record. 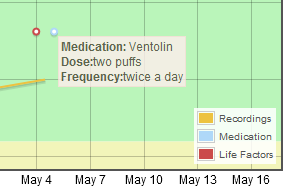 The medication change is then display on the graph as a blue circle. Clicking the blue circle will display the information about then medication change. The activities you do and the objects that you come into contact with every day can have an affect on your Asthma. For example going to the gym, walking the dog, doing DIY, etc. On the Peak Flow Diary website we call these events life factors. Using the Peak Flow Diary website you can record these Life Factors to help explain any changes in you Peak Flow Readings. On the Chart page click the Life Factors Icon which is situated below the graph. 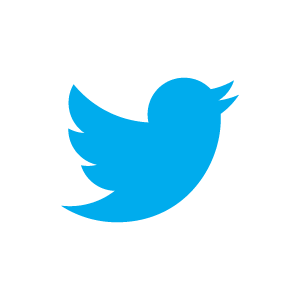 The icon looks like a flag. Then enter the date of the event and then enter a description of the event in the the text box. When finished click the Record button to save the Life Factor. 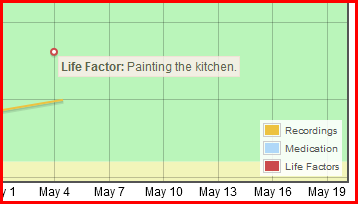 The life factor is then displayed on the graph as a red circle. Clicking on the red circle will display the description of the life factor.